Low Fat Fresh as Spring Creamy Deliciousness in a Bowl! What more could you want in a soup? 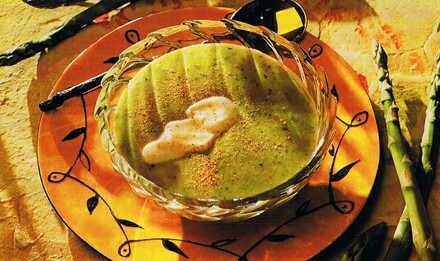 With less than 9% total fat this is Asparagus Leek Soup recipe is sure to become one of your springtime favorites! March through June is the peak season for fresh asparagus, which makes spring my favorite time of year! Asparagus has to be my all time favorite vegetable and I could eat it by the truckloads at this time of year! Of course, I love it in this great soup which is so scrumptious and so low in fat, you can literally have it whenever you need a quick meal or vitamin packed snack; but I also love asparagus cold on a salad; hot as my vegetable; or straight out of the fridge for a quick on-the-go snack. Ive got mad-love for asparagus, can you tell? The key to great asparagus is to make sure you dont cook the heck out of it. It shouldnt be all limp and stringy after youve cooked it. When cooked, it should still stand up straight, yet be tender. When cooked correctly, you cant help but love its delicate flavor, crisp-tender texture, and bright-green color. And asparagus can be steamed in the microwave in less than 8 minutes, making it a perfect choice for dinner on busy spring evenings. Place leek in a 2-quart casserole coated with cooking spray; microwave at HIGH for 2 minutes. Stir in asparagus and broth. Cover with casserole lid, and microwave at HIGH 10 to 11 minutes or until asparagus is tender. Place flour in a bowl. Gradually add ½ cup water, stirring with a wire whist until blended; add to asparagus mixture. Position knife blade in food processor bowl (or Vita-mix blender); add asparagus mixture, and process until smooth. Always be careful when youre processing hot food in a food processor or your Vita-mix. Return mixture to dish; stir in tarragon and milk. Microwave, uncovered, at HIGH 6 to 7 minutes, stirring after 3 minutes. NOTE: To micro-steam, just place asparagus and a small amount of water in a microwave-safe dish, cover with plastic wrap or a glass lid, and cook. This technique saves nutrients that are often lost by cooking in boiling water. Conserving valuable nutrients is important because asparagus contains rich portions of vitamins A and C, potassium, and fiber. All are recommended in anti-cancer and heart healthy menus. Give this quick and easy soup a go and I think youll love it as much as I do! Be sure to let me know what you think of this delish-dish! You know I LOVE COMMENTS!